With his obligatory shoutouts to Hadley Wickham and BoB Rudis, I felt compelled to reproduce the plot in RStudio and get some ggplot2 code out there open-sourcing his work. The tidyr package allows us to reshape our data between long and wide formats, RColorBrewer helps generate a fluid color pallete for our plot, and RCurl assists in sourcing the data from my gist. 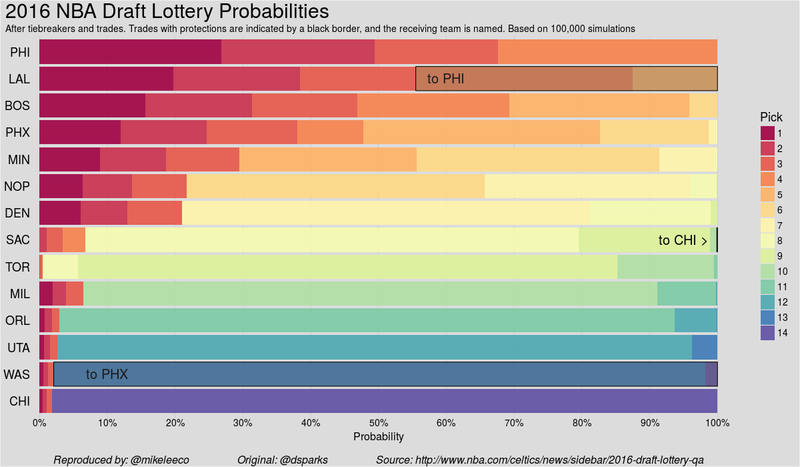 The colorRampPallete and brewer.pal functions expands the “Spectral” color pallete from 11 to 14 colors, and we’ve organized our Team y-axis to be leveled in order of likelihood of winning the top pick - without factoring in the projections that were used in the @celtics figure. Now that we’ve prepared our data, we can get to customizing the plot! The development version of ggplot2 on github features numerous additions including ecpanded arguments for labs such as subtitles and captions. Check out ?ggplot2::labs or Bob Rudis’ post on his contribution to ggplot2. As seen in the theme here, the developtmental version of ggplot2 also features elements to customize the new caption and subtitle arguments. Things are looking pretty sharp! Annotations - Call for Help! There has to be a more efficient method to do this! If you know of a better way please contact me on twitter or create a pull request on this post.